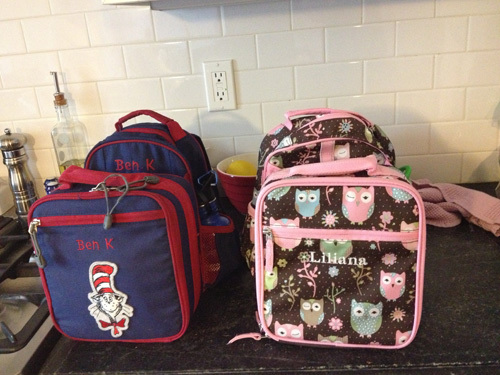 These are my children’s favorite school lunches. My criteria: a child can eat the food independently, no heating required. Some items are better for older children, and others for younger. Try not to pack containers that you’ll be upset about losing, even if you label them, as some loss is a guarantee. Do label your lunchbox, cups and containers. I use either a sharpie or a label maker from my home office. 1. Peanut butter or sunflower butter and jelly on whole grain bread. If nuts allowed, and you are open to some sugar, Justin’s makes a fake nutella that’s lower in sugar and still delicious. 2. Smoothie in a straw cup made at home from yogurt and fresh fruit. Here is one smoothie recipe that my kids love. 4. Fruit: grapes (halve if under 3 yrs old), apple slices (use lemon to stay white), berries. Pack in a 3 oz mason jar or small stainless container to keep from smushing. 5. Hummus (if school allows sesame seeds). Kids love dipping! We make it in the food processor in about 5 minutes. 6. Crackers (multigrain). Can use for sandwich or give with hummus. 7. Mini muffins. We make multigrain muffins with either bananas and berries, zucchini and carrots, or pumpkin banana (either bread of muffins). 8. Granola bar, cliff z bar, or your child’s favorite “healthy” option. 9. Yogurt. Don’t forget a spoon. A separate container of fruit that can be mixed in allows your child control at lunchtime.